Ovation Global DMC has named University of Westminster senior lecturer in business travel and tourism Rob Davidson as the Most Huggable Person of 2009. Ovation managing directors Patrick Delaney and Padraic Gilligan awarded Davidson the accolade because of his "enthusiasm, involvement, and passion for the meetings industry - especially for bringing young people into the business, as well as his charm and personality". "Among the flood of nominations received, we were impressed to see three distinct nominations for Rob and from far-flung locations such as the US, Portugal and Vienna," said Delaney. 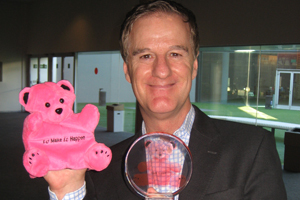 "His loyal and consistent support of the meetings industry at all levels makes him a worthy winner of the Huggability Award."